﻿ Crop circles - Current induction in plants - electro phytopathology. Explanation, decipher, decode, discovery, break code, explaining, decryption, puzzle out, scientific research. On this page will be demonstrated an experiment, whose result initiated all continuing subsequent research on possibility of lodging (damaging, weakening) and damaging crops and other plants due to the lightning discharges. It was a test of whether is possible, that in plant through electrical induction would be created such an amount of electrical energy, that could it significantly damage. 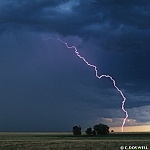 If it is possible, even if there would result only a minimal dissemination of energy below the soil surface to the sides and thus roots damaging, that after a lightning discharge into the crop field were immediately damaged also plant bodies at a distance of meters to tens of meters from the discharge. 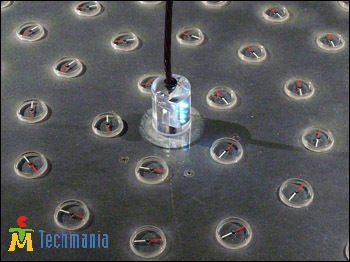 Diameter of lightning discharge channel only rarely exceeds 5 mm. Some resources show a value of 10-20mm, maybe depending on the exact measuring time point, that may differ in nanoseconds. For instance between the time of average current vs. maximum (peak) passed "much time", which is indeed expressed in microseconds, but during it may the diameter of the channel change several times. Average current maybe of two cases - rising and descending part of the curve, and the diameter in both two cases will be completely different. Most important is the finding that its diameter never exceeds few centimeters. As the results of that experiments was determined, that induction in plants is really possible. Just affecting and weakening of the roots would probably did not result in general weakness and degradation of above-ground parts of plants and subsequent lodging (damaging, weakening), its result would be only a reduction in yield. Existing germs of seeds would ripen only in below average size. The claim is of course a mere assumption, but it is of course always possible to statistically and experimentally confirm or disprove it. One could even say that it is a qualified assumption, pronounced on the background of many observations of plants exposed to certain conditions with negative effects to growth and maturation. Plant tissues contain some electrically conductive materials, mainly electrolytes. It is also possible, that they are such a poor conductors, that their contribution is such a slightly significant (subliminally damaging) to induction of electricity in plant tissues. Therefore, it is first necessary to determine whether a significantly different environment, such as electrolyte in the structure of plant tissues, against metal, can lead to electrical induction. Such a fact is not possible automatically presume, because the way of conducting current through an the electrolyte is from wire conducting (mostly metal) very different. In metals is current conduction caused by electron cloud, which are freely moving electrons of the highest valence sphere, whereas in electrolytes is electric current conducted thanks to anions and cations, moving in solutions. If it were formed by applying an electrical voltage between a cells some barrier (equivalent of electrolytic barrier), would be conducting electrical current through the induction of plant material completely impossible. The simplest method to persuade such a hypotheses, is a practical experiment. For the purpose of verifying the possibility of electric current induction in the plants was constructed a transformer, where were as the primary side 5 turns of copper wire and on the secondary side 2.5 turns built out of plant material. As the plant material was used a leaf of chive (Allium schoenoprasum), placed in a spaghetti insulation. The electrical resistance of chive was found as approximately 2.5 MOhm / cm. 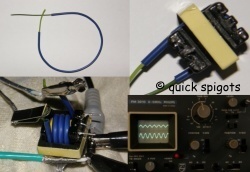 Into the primary coil of the transformer was connected 1kHz signal of approximately 0.3 V. The signal of primary and secondary coil was applied to the input of two beam oscilloscope. Some more pictures will be later placed here. Experiments were realized in May 2008. Prior to this experiment was realized a control experiment, where was used as the secondary coil material copper - as well 2.5 turns. Finally was realized another control experiment, to determine and eliminate the parasitic induction in the direct input wires, if some such inductions existed. Something like that is not simply possible automatically exclude, because the difference between the resistance of leading wires and plant material may be estimated at 109 times lower. 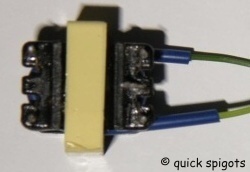 In the latter case was therefore used instead of copper wire nonconductive nylon fiber. All three experiments were completely identically spatially arranged. In the case of chive was measured voltage few hundredths of mV, in the case of copper - approximately 0.15V, nylon - nothing was measured at all, nor any hint of a noise. This was obviously due to the measuring technique used. The most important is the fact that the possibilities of any parasitic inductions were during the experiment sufficiently eliminated and measured currents did actually originate from induction in used blade of chive. In the case of additional experiments they were actually used like "setup of used measuring equipment" to the value 0 (zero correction) and 100%. It was in fact a twice-execution of a blind experiment. Not to be confused with the double-blind experiment, it is something entirely different. In such a case would have to evaluate experiments a fully independent person who would not at all be informed, what materials were used in which of the experiment. Such experiments (double blind) are of particular importance in medicine. 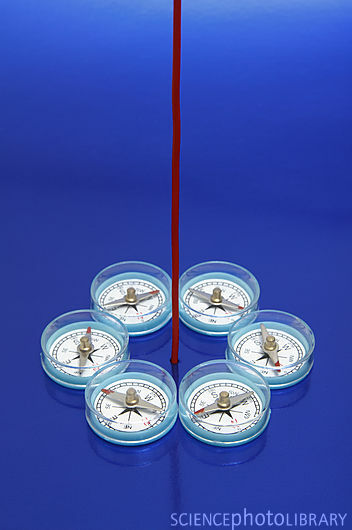 In simple physics there is not such a great need of using this research method, due to the possibilities of repeating such an experiment any time in the very same or very similar conditions, what is sufficient to objectively qualify the results and eliminate subjective influences. From the performed experiments is possible to deduce, that inside the plant material may be induced electrical energy by common electrical rules, and is possible deal with that. Most likely on that participate, as well as during the current conduction thro the plant, there present electrolytes. Equivalent circuit of plant may be regarded as predominantly serial connection of resistors groups. Currents are induced in plant material, similarly such as in overhead lines (see standard IEC - EN 62305 1-5). Just to be expected much higher resistance of plant material. Experiments are very simply executable, verifiable and reproducible. They are absolutely, without any exception, experiments executable in any school physical or biological laboratory. More general result of described experiments is finding that even in electrolytes is possible electrical induction. Even if it is electrolytic conduction. The practical impact of such experiments is probably almost none, because it is possible hardly require the constructors to build the transformer from the water or in water. Some other photos from the experiment arrangement possible to see on the left picture. Exactly at the moment of the lightning discharge flow through corn stalks conducted and induced electric currents, thanks to that their parts may exhibit electromagnetic properties and can behave like a magnetic compass needles. Magnetic field of average lightning discharge is at some point approximately more ten thousand times stronger than Earth's magnetic field. 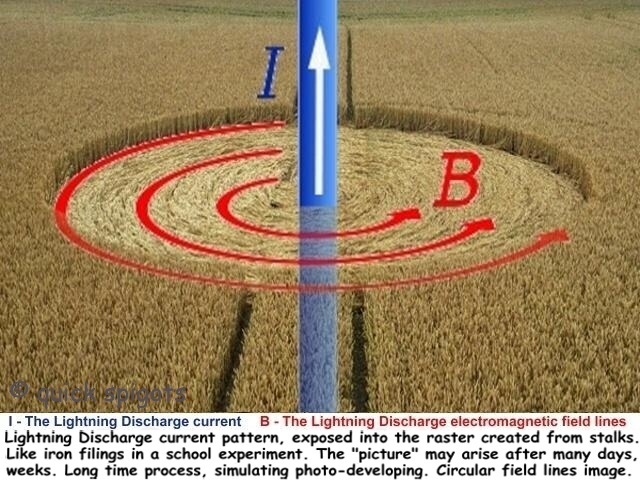 The radii of the circles approximately represent the ranges of lightning discharge electromagnetic effects.